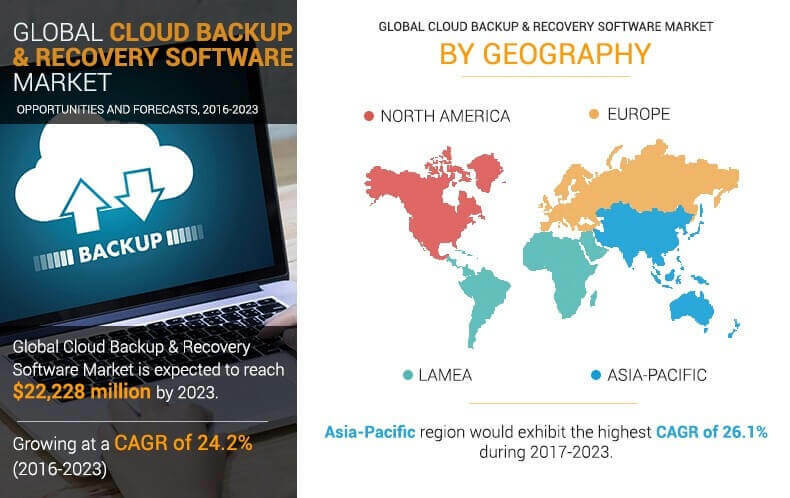 Cloud backup & recovery software market was valued at $4,950 million in 2016, and is expected to reach at $22,228 million by 2023, at a CAGR of 24.2% from 2017 to 2023. Cloud backup involves backing up of electronic data by sending a copy of the data over the proprietary or public network to a remote network server. Recovery and cloud backup play a vital role in business continuity strategy. The adoption of cloud backup provides additional benefits such as cost saving, and security, storage, and virtualization of the data. Cloud storage solutions provide infrastructure and application support to enterprises at a lower cost than on-premises storage solutions. 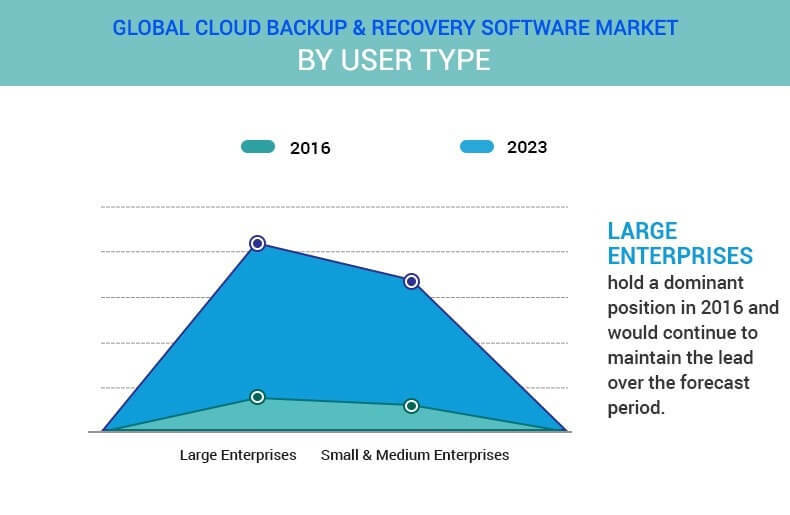 The cloud backup & recovery software market is driven by the need for companies to reduce their IT expenditure, increase in demand for cloud-based services across several industry verticals, and surge in backup requirements of enterprises. Furthermore, emergence of IaaS and on-demand cloud providers, increased adoption of smart devices and tablets, and high demand for big data and social networking present numerous opportunities for market progression. 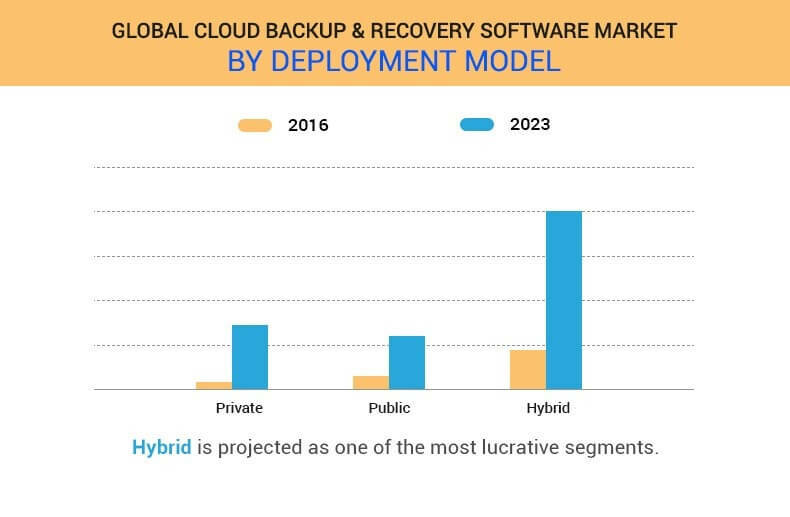 The global cloud backup & recovery market is segmented on the basis of deployment model, user type, industry vertical, and region. Deployment models covered in this study include private, public, and hybrid. Based on user type, the market is bifurcated into large enterprises and small & medium enterprises. On the basis of industry vertical, it is divided into BFSI, government, healthcare, telecom & IT, retail, manufacturing, and others. Based on region, the market is analyzed across North America, Europe, Asia-Pacific, and LAMEA. The market is expected to be driven by increase in focus on reducing IT expenditure, high requirement for cloud-based services across various sectors, growth in backup requirements of enterprises, and surge in adoption of these solutions among SMEs. However, latency in data retrieval and interruptions as well as storage management and securing backups replacement are expected to hamper the market growth during the forecast period. Cloud backup & recovery software solutions provide infrastructure and application support to enterprises at a lower cost than on-premises solutions. With the help of these solutions, companies can reserve and pay for only the amount of data they require and are actively using. This helps enterprises to reduce their capital and operational expenditure on IT infrastructure. The demand for cloud-based services is continuously increasing across several industry verticals, owing to numerous benefits such as reduced hosting costs, increased capacity, reduced labor and equipment costs, more streamlined operations, improved collaboration, and better productivity overall. In addition, the demand for cloud-based backup & recovery software is rising as cloud is an ideal solution for small- to medium-sized businesses, which cannot afford to implement an appropriate backup and recovery system in house. Data generated in an average organization is high in volume and diversity, and the time available for backup and the time allowable for recovery are decreasing. Organizations have a responsibility to properly manage critical business information. The inability to access information can cause unknown delays in conducting business, which can negatively impact the bottom line due, thus increasing enterprises focus on backup & recovery solutions. Emergence of different trends, such as infrastructure as a service (IaaS), on-demand cloud providers, growth in adoption of smart devices and tablets, increased need for big data and social networking, and others, is expected to create numerous opportunities for market expansion. Cloud backup & recovery software facilitates enterprises to securely copy the files to many servers. These software are safe from hard drive failures, which are common occurrences with PCs. The files are also encrypted in such a way that no one other than the user can view them, thus protecting the data from viruses and hackers. In addition, cloud backup & recovery software allows quick and easy access to all backed up files. The market for this software is driven by increase in demand for low-cost, secure, and efficient data access or storage solution as well as surge in backup requirements of enterprises, and stringent security and regulatory policies. Moreover, emergence of different trends such as infrastructure as a service (IaaS), on-demand cloud providers, and increase in adoption of cloud backup & recovery software among small and medium size enterprises has created immense opportunities for the market. Growth of the overall cloud storage market fuels the market further. Moreover, enterprises in Asia-Pacific, especially in India and China, are gradually developing their IT infrastructure and are focusing on development of new technologies and capabilities to extract the full potential of their existing systems and data, which boosts the market. Some of the key players operating in the cloud backup & recovery software market that are profiled in the report include Veritas Technologies LLC, Veeam Software, Commvault, IBM Corporation, Dell EMC, CA Technologies, Symantec Corporation, Microsoft Corporation, Hewlett Packard Enterprise, and Actifio Inc. Continuous deployment of database management solutions as well as increased adoption of smart devices and tablets are expected to provide sustainable market opportunities. The market players have adopted various growth strategies to enhance their product portfolio and market penetration, as well as they are investing in priority approaches for research to develop new products to increase their customer base and capitalize on the growing demand for cloud backup & recovery software. Moreover, many private cloud storage vendors are entering this market, increasing the competition for public cloud storage providers. "Cloud Backup & Recovery Software Market"